Farshadfar, E., Romena, H., Shabani, A. (2013). Evaluation of genetic parameters in agro-physiological traits of wheat (Triticum aestivum L.) under irrigated condition. International Journal of Advanced Biological and Biomedical Research, 1(4), 331-340. Ezatollah Farshadfar; Hossein Romena; Akbar Shabani. "Evaluation of genetic parameters in agro-physiological traits of wheat (Triticum aestivum L.) under irrigated condition". 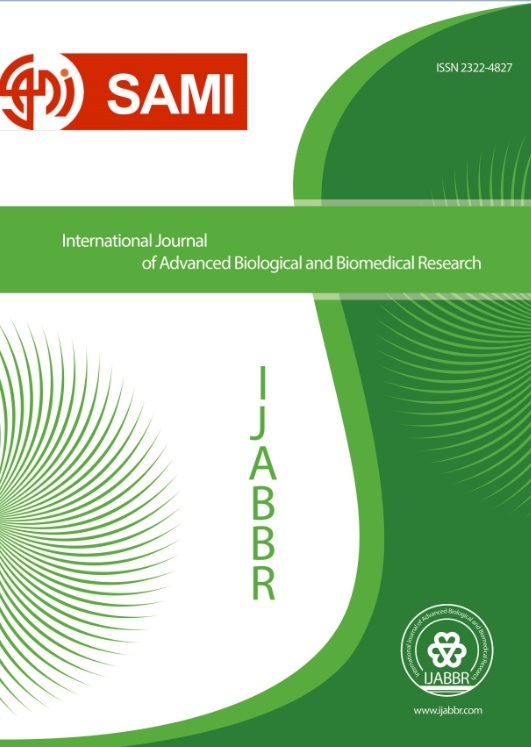 International Journal of Advanced Biological and Biomedical Research, 1, 4, 2013, 331-340. Farshadfar, E., Romena, H., Shabani, A. (2013). 'Evaluation of genetic parameters in agro-physiological traits of wheat (Triticum aestivum L.) under irrigated condition', International Journal of Advanced Biological and Biomedical Research, 1(4), pp. 331-340. Farshadfar, E., Romena, H., Shabani, A. Evaluation of genetic parameters in agro-physiological traits of wheat (Triticum aestivum L.) under irrigated condition. International Journal of Advanced Biological and Biomedical Research, 2013; 1(4): 331-340. Selection of genotypes based on high value of heritability and forecasted genetic conditions would be an effective method for improvement of wheat cultivars. The present investigation was carried out to estimate the genetic variability of agro-physiological characters using biometrical genetic techniques in 20 bread wheat genotypes under irrigated condition. For this purpose an experiment was conducted to estimate the genetic parameters of some agro- physiological traits and their relationship with yield under Irrigated conditions. High genetic variability was observed between the genotypes for the characters grain yield (GY), chlorophyll a (Chl a), chlorophyll ab (Chl ab), quantum yield (QY), performance index (PI), relative water loss (RWL) and leaf chlorophyll content (LCC), therefore direct selection is effective for improvement of these traits.Total chlorophyll content (Chl ab), chlorophyll b (Chl b) and PI revealed high heritability and co-heritability with yield. Hence, they can be used as indirect selection for the improvement of yield under irrigated condition. Ali, M. A., Awan, S. I. (2009). Inheritance pattern of seed and lint traits in cotton (Gossypium hirsutum). Inernationalt Journal of Agriculture and Bioogyl, 11(1): 44-48. Ali, M. A., Abbas, A., Niaz, S., Zulkiffal, M., Ali, S. (2009). Morpho-physiological criteria for drought tolerance in sorghum (Sorghum bicolor) at seedling and post-anthesis stages. Inernationalt Journal of Agriculture and Bioogy, 11(6): 674-680. Arnon, D. I. (1949). Copper enzymes in isolated chloroplasts. Polyphenoloxidase in Beta vulgaris. Plant physiology, 24(1): 1. Aycicek, M. E. H. M. E. T., Yildirim, T. E. L. A. T. (2006). Heritability of yield and some yield components in bread wheat (Triticum aestivum L.) genotypes. Bangladesh Journal of Botany, 35(1): 17-22. Barr, H. D., Weatherley, P. E. (1962). A re-examination of the relative turgidity technique for estimating water deficit in leaves. Australian journal of Biological Sciences, 15: 413-428. Bates, L. S., Waldren, R. P., Teare, I. D. (1973). Rapid determination of free proline for water-stress studies. Plant and soil, 39(1): 205-207. Bhatt, R. M., Srinivasa Rao, N. K. (2005). Influence of pod load on response of okra to water stress. Indian journal of plant physiology, 10(1): 54-59. Boote, K. J., Kropff, M. J., Bindraban, P. S. (2001). Physiology and modelling of traits in crop plants: implications for genetic improvement. Agricultural Systems, 70(2): 395-420. Chaves, M. M. (1991). Effects of water deficits on carbon assimilation. Journal of Experimental Botany, 42(1): 1-16. Chaves, M. M., Pereira, J. S., Maroco, J., Rodrigues, M. L., Ricardo, C. P. P., Osorio, M. L., Pinheiro, C. (2002). How plants cope with water stress in the field? Photosynthesis and growth. Annals of Botany, 89(7): 907-916. Cornic, G., Massacci, A. (1996). Leaf photosynthesis under drought stress. In: Baker, N.R. (Ed. ), Advances in Photosynthesis: Photosynthesis and the Environment, vol. 5. Kluwer Academic Publishers, Dordrecht, 347–366. Cornic, G. (1994). Drought stress and high light effects on leaf photosynthesis. Photoinhibition of photosynthesis, 297-313.
del Moral, L. F., Rharrabti, Y., Villegas, D., Royo, C. (2003). Evaluation of grain yield and its components in durum wheat under Mediterranean conditions. Agronomy Journal, 95(2): 266-274. Ehdaie, B., Waines, J. G. (1989). Genetic variation, heritability and path-analysis in landraces of bread wheat from southwestern Iran. Euphytica, 41(3): 183-190. Falconer, D. S., Mackay, T. F., Frankham, R. (1996). Introduction to Quantitative Genetics (4th edn). Trends in Genetics, 12(7): 280. Firouzian, A. (2003). Heritability and genetic advance of grain yield and its related traits in wheat. Pakistan Journal of Biological Sciences, 6(24): 2020-2023. Fischer, R. A. (2007). Understanding the physiological basis of yield potential in wheat. Journal of Agricultural Science, 145(2): 99-113. Flexas, J., Ribas‐Carbo, M. I. Q. U. E. L., Diaz‐Esoejo, A. N. T. O. N. I. O., Galmes, J., Medrano, H. (2007). Mesophyll conductance to CO2: current knowledge and future prospects. Plant, Cell & Environment, 31(5): 602-621. Food and agriculture organization of the United Nations, 2010. FAOSTAT 2010 Available at http://faostat.fao.org/site/368/DesktopDefault.aspx?PageID¼368#ancor. Ghandorah, M. O., EI-Shawaf, I. I. S. (1993). Genetic variability, heritability estimates and predicted genetic advance for some character in Faba bean. Journal of King Saud University Wheat Journal of Agriultural Research, 28(3): 193-200. Ghobadi, M. E., Felehkari, H., Mohammadi, G. R., Honarmand, S. J. The effects of supplemental irrigation and N-applications on yield and yield component in two wheat cultivars in Kermanshah condition. Annals of Biological Research, 3: 2118-2126. Guillaume, F., Whitlock, M. C. (2007). Effects of migration on the genetic covariance matrix. Evolution, 61(10): 2398-2409. Hunt, L. A., Reynolds, M. P., Sayre, K. D., Rajaram, S., White, J. W., Yan, W. (2003). Crop modeling and the identification of stable coefficients that may reflect significant groups of genes. Agronomy Journal, 95(1): 20-31. Jaradat, A. A. (1991). Phenotypic divergence for morphological and yield-related traits among landrace genotypes of durum wheat from Jordan. Euphytica, 52(3): 155-164. Kandasamy, G., Kadambavansundram, M. Rajasekaran, S. (1989). Variability in cowpea (Vigna unguiculata) under different environmental conditions. Madras Agricultural Journal. 76:197-199. Kashif, M. Khaliq, I. (2004). Heritability, correlation and path coefficient analysis for some metric traits in wheat. Inernationalt Journal of Agriculture and Bioogy. 6(1): 138-142. Kashif, M., Ahmad, J., Chowdhry, M. A., Perveen, K. (2003). Study of genetic architecture of some important agronomic traits in durum wheat (Triticum durum Desf.). Asian Journal of Plant Sceince. 2: 708-712. Krause, G. H., Weis, E. (1991). Chlorophyll fluorescence and photosynthesis: the basics. Annual review of plant biology. 42(1): 313-349. Lawlor, D. W. (1995). The effects of water deficit on photosynthesis. Environment and Plant metabolism. 129-160. Lawlor, D. W., Cornic, G. (2002). Photosynthetic carbon assimilation and associated metabolism in relation to water deficits in higher plants. Plant, Cell & Environment. 25(2): 275-294. Manju R. R. Sreelathakumary I. (2002). Genetic variability, heritability and genetic advances in hot chilli (Capsicum chinense JACQ.). Journal of Tropical Agriculture. 40: 40-46. Martre, P., Porter, J. R., Jamieson, P. D., Triboï, E. (2003). Modeling grain nitrogen accumulation and protein composition to understand the sink/source regulations of nitrogen remobilization for wheat. Plant Physiology. 133(4): 1959-1967. Maxwell, K., Johnson, G. N. (2000). Chlorophyll fluorescence—a practical guide. Journal of experimental botany. 51(345): 659-668. Memon, S. M., Ansari, B. A., Balouch, M. Z. (2005). Estimation of genetic variation for agroeconomic traits in spring wheat wheat (Triticum aestivum L.). Indian Journal of Plant Science. 4: 171-175. Miflin, B. (2000). Crop improvement in the 21st century. Journal of experimental botany. 51(342): 1-8. Mohammadi, R., Armion, M., Kahrizi, D., Amri, A. (2010). Efficiency of screening techniques for evaluating durum wheat genotypes under mild drought conditions. International Journal of Plant Production. 4(1), 11-24. Niari-Khamssi, N., Gassemi K., Zehtab, S. Najaphy A. (2010). Effects of water deficit stress on field performance of chickpea cultivars. African. Journal of Agricultural Research. 5: 1973-1977. Romena, M. H., Najaphy, A. Physiological characteristics and grain yield of wheat under irrigated and rain-fed conditions. Annals of Biological Research. 3 (7): 3178-3182. Sankar, B., Jaleel, C. A., Manivannan, P., Kishorekumar, A., Somasundaram, R., Panneerselvam R. (2007). Drought induced biochemical modifications and proline metabolism in Abelmoschus esculentus (L.) Moench Acta Botanica Croat. 66: 43–56. Sinclair, T. R., Purcell, L. C., Sneller, C. H. (2004). Crop transformation and the challenge to increase yield potential. Trends in plant science. 9(2): 70-75. Singh, R. K., Chaudhary, B. D. (1985). Triple Test Cross. Biometrical Methods in Quantitative Genetic Analysis. 93-101. Steduto, P., Hsiao, T. C., & Fereres, E. (2007). On the conservative behavior of biomass water productivity. Irrigation Science. 25(3): 189-207. Thiyagarajan K. (1990). Genetic variability in cowpea. Agricultural Science Digest. 10: 8-10. Wollenweber, B., Porter, J. R., Lübberstedt, T. (2005). Need for multidisciplinary research towards a second green revolution. Current Opinion in Plant Biology. 8(3): 337-341. Yin, X., Struik, P. C., Kropff, M. J. (2004). Role of crop physiology in predicting gene-to-phenotype relationships. Trends in Plant Science. 9(9): 426-432. Zeuli, P. L., Qualset, C. O. (1987). Geographical Diversity fo Quantitative Spike Characters in a World Collection of Durum Wheat. Crop science. 27(2): 235-241.